A cloud-based community-driven approach for advanced threat detection and prevention is paramount to successfully combatting attackers. The scale, speed of enhancements, community leverage, and automated prevention that WildFire provides is unparalleled. At the same time, some organizations are concerned about data privacy and protection when dealing with cloud-based threat analysis. 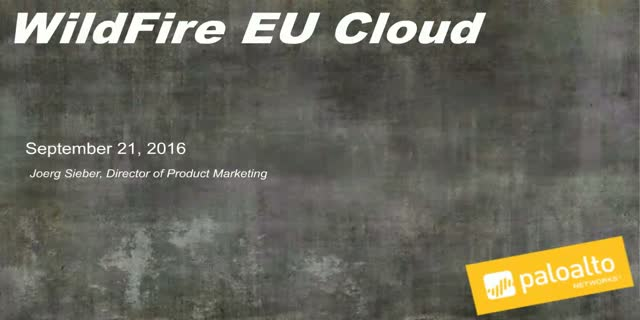 Palo Alto Networks is proud to introduce the WildFire EU cloud. Customers now have the option to submit unknown files and e-links to the WildFire EU cloud for analysis, where data is fully analyzed without ever leaving European borders. This is of particular interest to companies within the European Union and international organizations looking for localized clouds combined with the power of global cloud threat analytics. 1. Address data privacy needs – Data analyzed by WildFire EU cloud remains within the boundaries of the EU. This alleviates data transfer concerns shared by some of our customers and addresses the needs of many international organizations. 2. Leverage global threat intelligence – WildFire EU cloud leverages access to the largest threat analysis tool in the World used by more than 10,000 customers as part of the Palo Alto Networks next generation security platform, providing complete prevention capabilities. 3. Take advantage of groundbreaking Threat Analytics and Correlation – Security teams can accelerate threat hunting, analytics and response efforts with globally correlated intelligence from the entire WildFire community, made directly accessible through the AutoFocus service.